Youth media awards give us a unique opportunity to hone our evaluation skills, from literary quality to art appreciation, to figuring out what “outstanding” and “excellence of presentation for an intended child audience” mean. For this fall’s Butler Book Banters, we are kicking off a series of “mock” award programs, in which we’ll apply the real award criteria to books that are really eligible this year, then compare our results when the real ones are announced at ALA’s Youth Media Awards Press Conference during the Midwinter Meeting in January 2018: A Mock Pura Belpré Award on 11/9/17 and a Mock Coretta Scott King Book Award on 12/7/17. Books will be out at 5 p.m., we’ll have discussion from 6:00-8:00, and we’ll vote from 8:00-9:00. Pizza and drinks will be provided and participants may feel free to bring refreshments too! MOCK PURA BELPRE AWARD: Thurs. 11/9/17, 5:00-9:00 p.m. The Pura Belpré Award, established in 1996, is presented to a Latino/Latina writer and illustrator whose work best portrays, affirms, and celebrates the Latino cultural experience in an outstanding work of literature for children and youth. 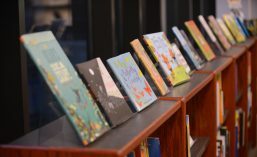 It is co-sponsored by the Association for Library Service to Children (ALSC), a division of the American Library Association (ALA), and REFORMA: the National Association to Promote Library and Information Services to Latinos and the Spanish-Speaking, an ALA affiliate. MOCK CORETTA SCOTT KING BOOK AWARD: Thurs. 12/7/17, 5:00-9:00 p.m. The Coretta Scott King Book Awards are given annually to outstanding African American authors and illustrators of books for children and young adults that demonstrate an appreciation of African American culture and universal human values. The award commemorates the life and work of Dr. Martin Luther King, Jr., and honors his wife, Mrs. Coretta Scott King, for her courage and determination to continue the work for peace and world brotherhood. First awarded in 1969, they are administered by the Ethnic and Multicultural Information Exchange Round Table of the American Library Association.